Tactical LED flashlights are fast emerging as the future of functional, multi-purpose handheld security tools. 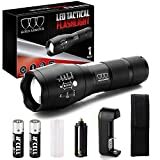 Although originally designed for use in the military and police services, tactical LED flashlights have burst onto the scene as superbly effective tools for hunting, game viewing, home, and public security, as well as a host of other uses. It’s essential to make the right choice for your flashlight needs when purchasing, so read on and discover our top picks for quality tactical flashlights for 2019. 5 Modes of 1200 Lumen Output. Waterproof to the IP65 Standard. Made of Aircraft Grade Aluminum Alloy. The TC1200 Pro has burst onto the 2019 security scene and has already racked up a very respectable reputation. It’s been boiled, lit on fire and dropped from tremendous heights, and held up to the challenge with ease. Because it’s made from aircraft grade aluminum and boating a staggering 1200 lumens, the thing is quite literally ready for battle. The fact that it has 5 modes, including high brightness, medium brightness, low brightness, strobe, and SOS, is very helpful and diversifies the usefulness of the tactical flashlight. This particular model and brand is the absolute best choice for use outdoors, as it is 100% waterproof, and is lightweight to keep on one’s person anywhere. The serrated edge is one of my favorite elements of the TC1200 Pro because it prepares for the very worst. Your last line of defense is whatever you are holding in your hand at the time of crisis, and brandishing a virtually indestructible, jagged-edged, blindingly bright light, sounds like a very prudent choice for a non-lethal weapon. 10/10 would choose to have by my side in the Zombie Apocalypse. When compared to the standard home-use plastic flashlight you might find in your garage, tactical flashlights evidently pack an exponentially greater punch in terms of brightness, durability, battery life and longevity, and are quickly becoming the favorite choice over their cheaper, more fragile plastic predecessors. Tactical flashlights are built with multi-functionality in mind, so they come with a variety of convenient features, such as the ability to be safely secured to a weapon, or a bicycle frame. They are also very often built with top-notch aircraft/weapon-grade aluminum, making them virtually indestructible by human error or attack. They still do, however, retain a very light-weight feel, making them a perfect tool to carry around on one’s person or in a small bag without feeling encumbered. What Important Features Should I Be Looking For When Buying A Tactical Flashlight? If you have already made the smart decision to go with a quality tactical flashlight, there are some key features you need to look out for. Of course, every purchase needs to be in proper line with how you intend to use the tool, and for what reason. For example, if you are planning on buying a tactical LED flashlight to protect yourself and your family from attackers and emergencies, whether it’s on a hike or at your home, the best option would be to get yourself a model that has multiple modes. 1TAC TC1200 Pro Tactical LED Flashlight can be set to flash 5 different ways, including its maximum bright light setting, that disorientates enemies and an SOS function that will allow the holder to flash a Morse code distress signal in a powerful spotlight. Another essential feature to look out for when making your choice is durability. Is this model waterproof? Does it use alkaline batteries, or is it rechargeable? Durability is really all about how well the product has been designed, and the quality of the materials used to construct it. Almost all tactical flashlights are made of very hardy aluminum and can withstand falls from tens of stories up and still perform. It is a no-brainer, really, to leave plastic behind and get something with substance. In terms of battery life, recent surges in CREE and LED technology have seen the incandescent bulb phased out, and replaced with LED bulbs, which consume far less energy to run, and last much longer if it’s a decent quality. Even the brightest tactical flashlight can run more than sufficiently on 3 alkaline batteries (AAA), some can also be recharged via a USB extension. Lithium batteries provide a fantastic battery life and fare well in very cold temperatures but are only compatible with a small amount of tactical LED flashlights. How Bright Is A Tactical Flashlight? The brightest tactical flashlight models can be found in the hands of spelunkers, search and rescue crews and fixed to the weapons of military officers. These are the kinds of occupations that demand excellent night vision, both as a floodlight and as a focused beam. They can exceed a whopping 1000 lumens, the measure of brightness for any flashlight – keeping in mind that your average keychain flashlight has a maximum of 20 lumens (read more about lumens below). 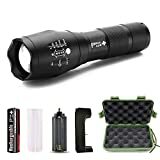 If you are in search of a quality tactical flashlight but aren’t going to find yourself at sea at 3 AM or deep in the Cango Caves anytime soon, it’s advisable to save yourself the unnecessary money and buy a tactical LED flashlight with a reasonable lumen count. Anything between 30 and 100 lumens is going to produce an enormously bright light, perfect for the outdoorsman, security officers, firemen, policemen, and personal protection. Can A Tactical Flashlight Be Used As A Bicycle Headlight? Tactical LED Flashlights are very useful when it comes to cycling, mountain-biking and joy riding. Because they are built specifically to attach to something, they can be fastened to the handlebars of any bicycle and used as a headlight, a general navigation device, and even an emergency weapon. Some tactical flashlights like the 1TAC TC1200 Pro Tactical LED Flashlight have a raised, serrated edge up front, making a defensive strike that much more effective. The higher a tactical LED flashlight’s lumen count, the lighter is being emitted through its lens. A good way to explain what kind of a scale we are talking about, a security guard will use a 100-lumen tactical flashlight on the job. The brightness of such a beam can temporarily blind and confuse assailants, giving them a better chance of preventing crime. For hiking, home security, emergency kits, game viewing, and hunting, staying above the 30-lumen count is the general rule in quality tactical flashlights. Professional nature guides religiously use night vision tactical flashlights with both flood beams (shallower and dispersed) and throw beams (long-range and intense), to spot an elusive cheetah in trees 1000 ft. away, or to illuminate a fresh lion kill in a small grove of trees. This kind of tactical LED flashlight, 1000 lumens and above, is where you’ll find the bright light sweet-spot. What Is CREE LED Technology? Cree® LED lighting is a true paradigm shifting improvement on the common LED light, producing more than double the lumens for the same amount of energy, and allowing the user to choose a warm, incandescent-like light, or a cooler, more clinical light. They are designed to work in harmony with any architecture, be it wall fixtures, string lights, and of course, tactical LED lights. The 1TAC TC1200 Pro Tactical Flashlight has this advantage, producing double the amount of light, and running for 50,000 hours longer than the conventional LED bulb. Replacing fewer bulbs and needing fewer bulbs to run your flashlight means far cheaper maintenance with less hassle and more reliability. Powerful Enough To Light Up An Entire Room. Power Source: 1 x 3.7V 18650 Battery. Adjustable Focus Range For Different Usage. The X700 Tactical Flashlight Ultra-Bright is a stylish and competent security companion. It’s as though it really wants to be the TC1200 Pro Tactical Flashlight but just isn’t quite there. Its respectable 500 lumens are still 5 times brighter than a standard police-issue flashlight, but without CREE LED technology, it pales in comparison to the overwhelmingly bright light of the TC1200 Pro’s 1200 lumens. Also made of high-grade aluminum, it can take a lot of abuse, while still offering the impressive feature of three brightness modes, an SOS flash sequence, and a strobe effect. If your budget is tighter and your parameters are slightly lower, the X700 is a responsible, practical and economic choice. Super Bright High Performance Tactical LED Flashlight. High Lumens LED Makes The Flashlight 10 Times Brighter. Water Resistant, Anti-Abrasive, Skid Proof. 5 Light Modes And Zoom Function. This tactical flashlight has a lot to offer. It is water resistant, making it very handy for fishing, hiking, camping and working in wetter conditions. It also has the privilege of running off a rechargeable lithium-ion battery, which is lighter than alkaline batteries and has better temperature fluctuation tolerance and overall energy efficiency. It can also accommodate AAA batteries, which is very convenient as lithium batteries are not always readily available, and in an emergency, it is vital to have extra batteries on hand. Ultra Bright Professional Grade Tactical Flashlight. 2 18650 Rechargeable Lithium-Ion Battery. Same “Military” Grade Flashlight As Seen On TV. Like the PeakPlus model reviewed above, the Gold Armour Super Bright is water resistant, has dual battery accommodation and can be switched between five different modes quickly and easily. What makes it different, is the price. At just over $10, Gold Armour is far more affordable than some of its higher performance competitors, and although this might seem like a great thing at first, it’s water-resistant design only protects the flashlight from minor splashing, as against truly waterproof tactical LED flashlights that cost more. If you are fishing, hiking, exploring caves or exposed to wet conditions regularly, its best steer clear of this one. The reality of the security industry is that quality counts – a lot. Some people are fully prepared to buy a middle-of-the-road product and commit to the responsibility to regularly maintaining, inspecting, repairing and replacing, but others are looking for something stronger. Something that can withstand a 100 story fall from a mountain’s edge, be boiled alive and even be ridden over by an enormous construction vehicle, and then perfectly illuminate a road sign miles away. For those who take their bright lights seriously, follow the lumens, don’t be afraid to use a few extra dollars, and remember that for the outdoors, durability is key.